"This project actually started in February 2013, under the scorching heat of Uganda. I was in Entebbe involved with the 5X8C DXpedition alongside the other F6KOP operators. A long series of unanswered calls got suddenly interrupted by the ringing of my phone. Because the call was coming from RéunionIsland I quickly answered it. This conversation was the first exchange with the prefecture of the TAAF (French Southern and AntarcticLands) about a radio expedition project in the southern territories or the ScatteredIslands. I had impatiently been waiting for this contact after I had sent a file to St. Pierre, the seat of TAAF, a few months earlier. " This is the story of this DXpedition. In 2000, during the DXpedition to Tromelin organized by the Lyon DX Gang team, Météo-France was the main contact; as for the permissions they were issued by the Ministry of the overseas territories. Since 2005, things have changed with the attachment of the ScatteredIslands to the TAAF prefecture. The first step of our project was to compile a complete dossier to establish a first contact and explain key aspects of our project: what amateur radio is, who ham operators are and more specifically the members of our team, why such an interest for the TAAF and the Scattered islands? After several years of research and exploration, a contact was at last established in February 2013. Very soon we understood and apprehended our respective constraints. Several telephone meetings and email exchanges followed. A month later, a meeting in the building of the TAAF in Paris allowed us to finalize the destination and dates of operation. Tromelin will be back on the air at the end of October 2014, after 13 years of radio silence. The ham community was then informed of the existence of the project through a press release widely reported and disseminated on many media. Right away we received encouraging thoughts and feedback, how exciting! The work done so far discreetly could finally begin to be displayed. Such an adventure could not be improvised, and although the timing seemed relatively large, we knew from experience that there was no time to waste. As soon as TAAF agreed in principle we engaged in a thorough preparation both administratively and logistically, without neglecting the human side too often underestimated. This fact is of paramount importance, even more so when the DXpedition takes place on an uninhabited island. Conditions can quickly become extreme because of the climate, the isolation and sleep deprivation, not to mention the tensions that can occur in case of technical failure or accident. From the first exchanges with our interlocutors, it appeared as obvious that this DXpedition could only be conducted with a small group especially as the environmental and logistical constraints increase exponentially with the number of visitors. An experienced and multidisciplinary team was formed by taking into account both the skills of each person as well as the personality of every member. All operators knew each other perfectly well after being part of many expeditions together. Several employees responsible for specific topics helped us. Some were there from the beginning, while others have been integrated as needed. This small size close-knit team hasallowed us to be efficient and responsive. The green light from the authorities was subject to several conditions, including management by our team of transport and logistics. Aware of its complexity, we expected to deal with a difficult issue, but we were miles away to imagine that it would mobilize us daily until the very last day of the operation. Located 450 km east of the coast of Madagascar and 650 miles north of Réunion, the island is very isolated geographically. Access by sea is practically impossible due to the fringing coral reef which almost eliminates the chances of landing, even with small boats. While this option had been studied, we quickly dismissed it. Don’t forget that the TAAF had to validate the transportation plan and no doubt that a dangerous solution would have been denied. Therefore, air access was our only chance to set foot on Tromelin. In theory, we only had to find an aircraft and a pilot likely to land safely on the runway that crosses the island from end to end. Our specifications provided transportation for 6 operators and equipment from RéunionIsland to Tromelin in a minimum number of rotations. Transport via the military aircraft being not possible, we embarked on the study of other possibilities: private and public flights. Plan A was soon arranged with an aircraft based in Réunion. It seemed appropriate for this type of mission, although it had only a low carrying capacity for the equipment. It was up to us to optimize space and weight allocated to our equipment (200kg) to stick to two or three planned rotations. Two meetings with the pilot were held in January and May 2014, visits during which we were able to discover the plane and to fully appreciate its characteristics while flying over Réunion island. In parallel to the transportation component, logistics was organized. Although each of us had made some of their own equipment available to the shipping, some key pieces were missing. As it was, our budget did not allow for the purchase of such equipment. However, after being asked, several manufacturers and hardware vendors came forward to help us, not counting those who spontaneously contacted us to provide their assistance. Thanks to this mobilization, we had access to loan equipment or on preferential terms of purchase. Our original plan was to operate three radio stations 24 hours a day, which already seemed ambitious for a team of 6 people for 10 days. For harmonization purposes, we opted for identical configurations: transmitter, computer, cw-digi interface, each piece of equipment being able to be connected at any time on any station. Each transceiver could be used regardless of the mode or band used. The preliminary study of the land and especially the location agreed to our radio site on the island led us to consider the use of VDA (Vertical Dipole Array) for the higher bands. The ratio weight /efficiency for these antennas is interesting and superior to what you get with yagi antennas, especially when installed on the beach. Low weight and small footprint when folded was an undeniable asset that met our expectations. In addition, verticals were to be used for 30/40/80/160m. The feasibility of mounting each antenna with respect to the available space was studied by considering the coaxial lengths and the wind load. On the island trade winds blow constantly and large antennas would have represented a risk during the assembly as well as during the strongest wind gusts. With his experience, Vincent F4BKV took over the manufacturing of VDA while Flo, F5CWU, focused on antennas for the low bands. In order to respect the total weight allocated, we had to optimize each element keeping in mind the following criteria: robustness, reliability, light weight, performance. While part of the team was preparing the equipment, we had to take over the transportation issue, our plan "A" being questioned after a few months. Although the pilot and his aircraft were OK, some administrative rules made this solution "complicated" and difficult to be approved by the authorities. The irony is that the same plane with another pilot or the same pilot with another aircraft would have been accepted, but not the combination of both. Considering this complexity, we quickly got some help from a few experts in France, as well as the competent authorities on RéunionIsland. The transportation component thus became a daily concern that gave us sleepless nights until the departure. Due to these complications we had to deal with the aviation regulations (type of aircraft, characteristics, engine, pilot qualification). We crossed out Plan A and made some room for plans B, C, D, E, F, etc! Whatever would happen, we had to make sure that we had a valid solution both technically and administratively. Using a very good network, we became aware of which aircraft and pilots of the Indian Ocean area may offer a solution. After contacting them, each option was studied and several options were in place. The final solution came from the Comoros. It is in this small country that a company named Interîles will soon take over the whole space in the Indian Ocean zone. Although slow to implement, our exchanges helped to ensure that the aircraft and crew were able to secure a flight to Tromelin. Yet we will have to wait until the day of departure, on the tarmac of the airport in Mayotte for the latest documents to be signed! More later. In May 2014, Michel, FM5CD, and Sébastien, F5UFX, went to Réunion Island for a working week. After a tour of the permanent exhibition in the premises of the TAAF in St Pierre, meetings were held at a high pace: update on the burning issue of transport, exchange and training with the people in charge of environmental protection, validation of administrative aspects, discussion with the head doctor, logistics and communication. The schedule of these days was very dense. Each topic was discussed exhaustively with appointments very well prepared in advance, and contacts perfectly mastering their area of expertise. Several very pleasant surprises regarding logistics were announced. The first was the opportunity to take advantage of an extra rotation of the Marion Dufresne (a research and supply vessel) in the Scattered Islands to get our equipment to Tromelin, eliminating the limit of 200kg imposed by the aircraft. The second is the provision of a reliable and redundant solution for the supply of energy. Those who have organized this type of project will appreciate this opportunity to its true worth. Although these proposals led to new costs involved, they provided a definite plus to the project. The exchange ended by defining all the actions to be implemented to enhance our activity and ensure a high level of communication for the TAAF. That work week concluded with a meeting with Mr. Pascal BOLOT, prefect for the island. Together, we discussed our future mission and discussed our amateur radio activities. Michel, FM5CD, who had freshly returned from Amsterdam Island, also addressed FT5ZM. This trip to Réunion Island was utilized to purchase various equipment and tools that would be loaded directly on the Marion Dufresne. Only the last day allowed us to do some sightseeing, guided by our friend Axel, FR5GS, who would play a key role in the organization of exchanges with schools. From the draft of the introduction dossier to the records and the press releases, particular attention was paid to the explanations. The media and means of communication were numerous; yet they needed to be used wisely. To do this, we were assisted by Cedric, F5UKW, website development specialist. His technical work, combined with the content we had provided him allowed him to upload our website in late 2013. He regularly updated it with articles and reports. Since its launch, we have recorded nearly 125,000 visits, with peak attendance during the stay. In addition to the presentation of our radio project, we wanted people to learn more about the history and the peculiarities of this tiny speck. To do this, several articles were published in journals, so as to reach the greatest number. Thanks to this hype, it would have been hard to miss the event. The conclusion we can draw from reading the comments received so far is that the project was a wonderful means of communication. This enthusiasm for our mission on Tromelin has spread far beyond the amateur world. From ecology to philately and schools, the island became the intersection for a multitude of enthusiasts, experts and travelers who can now locate Tromelin on a map. Such a project required a very large budget. Although partly assumed by the operators nothing would have been possible without the mobilization and the generosity of all the amateur radio community. Dozens of sponsors were solicited and we gave everyone the opportunity to contribute to the project in the form of an online donation. Only minutes after sending the press release announcing the expedition, the first donations were recorded, often accompanied by a word of encouragement. These were spread over the entire period of preparations and until we returned from Tromelin. Concerning clubs and associations, the INDEXA was the first to support us, soon imitated by many others. An exceptional grant from the NCDXF made the project possible. At this stage, we were confident! If on one hand the donations continued coming at this pace and on the other hand our expenses were contained, the budget should be completed on our return. With this in mind, we are compelled to control the expenses. The fact that we could balance our budget thanks to all was definitely a plus but at the same time it added extra pressure to do well. There was no room for error! The TAAF offer to transport our equipment with the Marion Dufresne dramatically changed the profile of the operation. This opportunity, however, forced us to speed up the collection of funds, and testing and packaging of our equipment. Everything had to be completed four months earlier than originally planned. Informed of this program change, our sponsors reacted very quickly. Flo, F5CWU, surrounded himself with a small group for all preparations. The boxes were manufactured, coaxial cables cut, connectors were welded and each item tested many times in real conditions before being packaged. All equipment lists were checked and rechecked before the boxes were sent to the logistics provider for TAAF in Marseilles: departure for Tromelin via Réunion Island. The weight and size of the crates were intended to ensure safe transport by ship, but also unloading by helicopter to Tromelin. It’s in late August that we were informed that everything had arrived and was stored on the island. A very important step had been taken. Only sensitive equipment (transmitter, computers) were retained and were to travel with us as carry-on. Concretely, compared to the planned 200 kg of equipment, it was ultimately about 800 kg that were shipped with notable improvements on amplifiers, low loss coaxial cable, antenna, and emergency equipment. Looking back, we do not see how we could have done otherwise. Therefore we were able to install up to 6 stations simultaneously. No equipment was unnecessary because on several occasions we found ourselves using all of them. Similarly, we never fell short of a connector, a tool, or a meter of cable. It was a flawless preparation and we did it. The preparation of the main communication operations was also a daily activity throughout the year before the mission. Philately is for TAAF both a source of income (7-9% of the budget) and an excellent communication tool. Each year, about fifteen stamps are edited, presented at special fairs and marketed through several distribution channels. The dates and location of our operation were set to coincide with the 60th anniversary of the first amateur radio link from Tromelin. Naturally, the idea of a commemorative stamp was used. The team was actively involved in the realization of it by providing a rich documentation to the artist responsible for creating the model. Under the leadership of the head of TAAF philately, this project became a reality. The aim was to present it to the fall philatelic exhibition in Paris. The dates of the exhibition and DXpedition being concurrent, it was suggested that contacts between amateur radio operators on the TAAF stand and Tromelin Island should take place. We entrusted this technical challenge to a radio club team (F6KOP) in Provins. The challenge was complex! First it was necessary to remove the many administrative constraints on the installation of antennas in the heart of Paris, even temporarily. Furthermore, the system had to be reliable and efficient enough to ensure daily radios transmissions of several thousand kilometers. In addition to these demonstrations, we were asked to present our activities to visitors throughout the event. This activity around the block of mint stamps was a publicity stunt for TAAF, but also an excellent opportunity to promote our amateur activity with a large audience composed of collectors, officials and journalists. 6,000 km away from Paris, Réunion Island was also in turmoil. Thanks to the help of a teacher, relay with TAAF, Tromelin became a work topic for several schools: history, geography, fauna and flora were to be studied. This work resulted in numerous exchanges of letters and emails prepared by the students and their teachers, along with highly relevant issues related to the adventure that was coming up: our means of transportation, living on site, waste management, water, etc. In order to extend these exchanges, we enlisted the help of amateur radio operators from Réunion’s ARRA to establish temporary radio stations in several schools in order to make "live" connections with our team on the island of Tromelin during the expedition. Throughout that year of preparation, work files were numerous, all very important and time consuming. Everything had to be absolutely completed by October 30, the date of our departure. Thanks to the hard work of the whole team, this goal was achieved. Our three crates arrived and were stored away on the island. The on-site TAAF staff decided to test the generators and ensure fuel supplies. To transport the remaining equipment in our possession each operator was given a full station to get used to it and become familiar with the equipment before departure. Still, there remained some concerns: a missing signature to install the antenna at the philatelic exhibition, the announced visit by a DGAC (FAA equivalent) inspector in Mayotte for a final check of the aircraft before our departure, a technical stop in Madagascar…enough potential worries for more sleepless nights. The first exchanges with Interîles had suggested the ability for the aircraft to perhaps transport one or two extra people. For their part, the TAAF had endorsed this possibility. In anticipation, the medical records of our two extra operators were submitted to the Chief Medical Officer for approval. The news came just a week before departure. We asked Guillaume, F4FET, to join us in Mayotte. This additional person was definitely a plus to the team. Last week of October finally came! Seb, F5UFX, Flo, F5CWU, Frank, F4AJQ, and Fred, F5ROP, left France to rally Mayotte. Michel, FM5CD, whom we briefly saw in Paris, flew on another airline. We were greeted by Vincent, F4BKV, on site as he had been there for a few days to participate in the CQ WW SSB. At the hotel, we met with Guillaume, F4FET. The decor might have suggested holidays of some sort but the pressure was at its peak. We took these final moments of respite to retest the equipment, control configurations, probably a way to occupy our minds and manage stress. Some contacts were made with each transmitter to make sure none suffered any damage during transport. The last briefings were long and studious. The whole team sized up the stakes of what was expected. Each item and set was detailed, checked and reviewed. We needed to live up to expectations! Personally I knew from day one that the team was perfectly capable of managing the "radio" aspects once there. The little time left was fully used to recheck each document with all the authorities and the various providers to ensure that our aircraft could take off and bring the team on Tromelin as scheduled on October 30. All systems go, but experience has shown us that a turnaround can happen. By late afternoon, Claude, F5GVA, in charge of the team that must intervene at the philatelic exhibition informed us that the mast and antenna will indeed be installed in Paris, a happy ending for a last minute administrative imbroglio. Our last evening in Mayotte was spent with our pilots and co-pilots. They too were excited to land on Tromelin as this privilege is usually reserved for the FAZOI (French Armed Forces in the Southern Zone of the Indian Ocean) pilots. They informed us that the mandatory technical stopover would be done in Tamatave and not in Sambava as we had expected. In addition to a change in the flight plan, this change was going to lengthen the travel time by a few hours and delay our arrival on the island. The night was short as a result of the excitement that we were experiencing due to the deadline approaching. We were all ready at the time agreed the day before. A quick taxi ride took us to Dzaoudzi airport that had just opened its doors. At this early hour, few flights were scheduled which allowed us to check our bags and go through the controls smoothly. The crew that we met on arrival was confident that the departure time, estimated at 7:30, was still on although an umpteenth control by the DGAC and gendarmerie was scheduled before takeoff. All these checks were OK, but they delayed us by 2 hours. The first stage of the journey took place peacefully, each of us waiting to take off again from Madagascar to relax. This technical stop left us just enough time to stamp our passports and go to the restroom. Once the aircraft is filled up, we immediately set course to Tromelin that appeared on the horizon after about two hours of flying. What a thrill! The approach was conducted camera in hand to capture this moment so long awaited. The landing was perfect with applause aplenty. As soon as the aircraft stopped, Patrick, Henri and Eugene, the three TAAF officers stationed on Tromelin came our way and helped us unload the luggage. The crew did not linger. The aircraft flew back to reach Madagascar before dark. From our side we let ourselves be tempted by a good coffee before hitting the assembly part. Without further delay the equipment was unpacked. Our three crates were positioned before we arrived on the steps of the Malagasy house, our lodging for the duration of the mission. Each antenna, cable, radial was labeled. We engaged in a race against time to install the maximum possible antennas before dark. Everyone knew exactly what he had to do. Priority was given to the 160m antenna and the 2-element multiband Step-Ir. Other verticals were summarily installed so as to use several bands on the first night. The mounting of other antennas, requiring more time, was postponed until the next morning especially since they could not have been completed before dark. We agreed to have a break for dinner. This was an opportunity to receive safety instructions and information on the life of the station. We did not linger. The stations were wired, the computer network set up. Sébastien, F5UFX, started with V51B followed by OE3GCU. The 5 stations got operational and were soon triggering huge pile-ups. The first night QSOs allowed us to achieve more than 2,000 contacts with surprising results including 160m, even though no receiving antenna had been installed. The pile-ups would have been endless, but we remained reasonable and some of us slept for a few hours in order to be fully fit for the setup the next days ahead. Right at sunrise, we began the assembly and installation of the 4 x VDA, the 4-square for 40/30m, and the 80m vertical. Each antenna was positioned at a location approved in advance by the TAAF. We adapted to the natural environment (bird nests, turtle nesting holes). Working long hours under these conditions was not without risk. Michel, FM5CD, was mandated to remind everyone on a regular basis to hydrate and protect themselves from the sun. This simple task would spare us from sunburn and sunstroke, which would obviously have affected the result of the operation. We postponed to the next morning the installation of the 20m VDA, 6m yagi and the second 80m vertical as the heat became intense. The team split for meal breaks. They were an opportunity for lengthy exchanges with our hosts. We asked them many questions to which they responded with passion. We told them about the purpose of our mission and our activity. Eugene, our cook, had been a regular on Tromelin for decades. Upon our arrival, we had recognized him since he appeared on videos from the previous operation (FR/ F6KDF/T). Besides, he perfectly remembered that DXpedition and mentioned some details and anecdotes about the radio activity of the meteorologists, including those of Jacques, FR5ZU. Seb discovered with Patrick aka “PP” the weather station facilities and learned the procedure to send the logs and emails via satellite. The tour ended in the room where the generators were installed. Patrick provided supervision and maintenance. For an expedition to an island so isolated, our conditions were ultimately more comfortable than expected which is good since this allowed us to focus entirely on radio activities. The work done so far by the 7 members of our team was huge, despite difficult conditions. All of the equipment provided was operational. No antenna needed adjustment, proof if any were needed that careful preparation is not superfluous. Propagation forecasts prepared by Vincent were displayed and instructions were stated a last time. From now on, we needed to satisfy the greatest number! Between two radio sessions, we conducted tests to improve reception on the low bands. The 5 main stations were on the air. We used the backup station installed on the bench outside as a beacon for 6m. We soon needed to assign an operator to that station because the band opened up. The first openings were towards the Middle East. We fully measured the enthusiasm of the entire planet around our project. Propagation conditions were exceptional. The same band could open to Japan, Europe and the United States simultaneously. We did not let ourselves be carried away and stuck to our original plans. As clear as they were, our instructions were sometimes difficult to enforce as the world jostle to make contact at all costs. If you thought that the pileups seemed dense from your side, know that you were hearing only a small part of them. Even our performing equipment was close to the limit of saturation. Despite filters, attenuators and the experience of the operators, we had no choice but to greatly expand the splits. This will be true from the first to the last day of our activity. By late afternoon, a 200m reversible beverage covering North America and Europe was installed. Skeptical about the performance of this kind of antenna in this environment, it proved to be an ally of choice and worked well even without a preamplifier. Both directions allowed us to toggle between the short path and long path, position on which we listened to the west coast of the USA (W6-W7) from 30m to 160m. The second beverage stretched towards Japan remained less efficient, probably due to the proximity of water or the physical setting in this direction. Again very good openings on 6m to Asia and in the evening to Europe. The number of contacts increased. Five (or six) stations kept busy the whole day. At night we kept "only" 3 to allow everyone to sleep. This was back-to-school day on Réunion Island and the first date in a long series with students, since each half day until Wednesday would be devoted to a different school. The tests carried out the day before between Frank, F4AJQ, and Axel, FR5GS, confirmed the feasibility of the link. The 40m band was chosen because on one hand it offered the best signals for short skip propagation and secondly it was not used in these time slots. ARRA Amateur radio operators took the opportunity to show students in different schools what our hobby is all about. Journalists had been invited and again we took the opportunity to talk about our activity. Contacts between Frank and amateurs in different schools started. The Q&A took place for about an hour, questions such as how we got there, to do what, how did you wash, what made your stay on Tromelin remarkable, etc. Right after these conversations, we turned off our generator to perform routine checks and maintenance. We used this moment to have lunch together and discuss the direction to take after analyzing the first statistics and feedback from our pilot stations. By mid-afternoon, other schools were contacted. Everyone enjoyed the contacts, operators, children, and teachers. Patrick, Henry and Eugène came by and had fun with the type of questions asked. According to feedbacks from Axel, FR5GS, media coverage was good. A long article was in preparation for the local newspaper. The pace was frantic. Yet the pileup stopped suddenly. Fred, F5ROP, found a small turtle at the steps of the Malagasy house, probably attracted by the lights. Since our arrival we had been waiting for this moment. We indeed had observed the previous days some turtles laying eggs on the beaches at night (the reason why we could not install our antennas there) but this impromptu meeting was something out of this world. Caught and released in the ocean, we returned to our stations where the pileup resumed as if it had never been interrupted. At breakfast, we received email news from Yann, F1NGP, our QSL Manager. He just got the LOTW certificate we applied for before we left providing the required supporting documents and proof of our presence on the island when we arrived. In great secrecy, we had decided to load the logs during the expedition on LOTW, an approach that was hailed by the amateur radio world. Feedback submitted by our pilot stations was taken into account though sometimes contradictory. No band was open 24 hours a day, not even 20m which completely closed for a few hours after our sunrise. We adapted our presence and hours of rest around these moments of respite. The 10m and 15m bands were exceptional and were the two bands that had the longest openings. Logically enough, we made the most of it and did not let an opportunity go by. We were about to surpass the 50,000 contacts. The day before was the most prolific day with 8,500 QSO. As expected, the West Coast of the United States remained the most difficult area to contact, but we strove to make every effort to achieve it. These efforts were rewarded particularly on 30m and 40m long path at our sunset. That morning, we had some rain, but not enough to fill tens of tanks distributed around the station. This was the first time we had rain since our arrival. Water management remained a key concern for the TAAF staff, which was able to educate us on our arrival. A pump system could raise the water so it could be used for showers, kitchen, toilet, but it could not be wasted, especially here more than anywhere else. The rainy season was eagerly awaited because reserves were dwindling. Thursday was also the first day of the philatelic exhibition. At the time and frequency agreed we called, somewhat anxious. After a while, we heard the guys back in Paris answering. The connection was not excellent but the contact was established! The operation would be repeated for 4 days, morning and afternoon until the end of the show. That day was a bit special since it was Flo’s birthday. For the occasion, Eugene prepared an apple cake and we used a second generator maintenance check to have this meal together. Having one’s birthday on Tromelin is a rare privilege! The connections with the philatelic exhibition, in the form of fifteen-minute exchanges came and went under excellent conditions. Again, feedbacks were extremely positive. We were told that the imminent contact was announced through the sound system of the show. At that moment, the TAAF stand would become the center of attention. The audience held their breath anxiously waiting to hear FT4TA on the radio. People got interested and asked many questions. All would like to speak into the microphone. Journalists were also present. The F6KOP members were on the stand from the opening to the closing of the exhibition, introducing our activity and answering all kinds of questions. The milestone of 60,000 contacts being reached we immediately increased the new goal to 70,000. By chance, the 70,000th QSO would be performed on Sunday evening with the philatelic exhibition. Throughout the weekend we had a steady heavy traffic although a CW and RTTY contest paralyzed our activity on the so-called traditional bands. This had the effect of dramatically slowing down our progress even though the conditions were excellent. The end of our sojourn nearing, we established a dismantling schedule over two days. On Sunday, the 20/17/15 VDA were folded as well as the 160m and 80m verticals. The 4-square was dismantled; only a long stick would be used for each band. The last night, only the 10m/12m VDA, the Step-Ir and two vertical dipoles were kept, the very same ones that had been employed the first night. The team members who did not operate were working to clean, package and store equipment in the crates. We spent our last evening having a meal together. This was an opportunity to prepare some memories: group photos, signing special envelopes with "our" stamp, autographing of the flags, etc. The only trace of our passage was left in the guestbook of the weather station. So FT4TA went down in history of Tromelin alongside the many events contained therein. The last items were quickly removed and protected with a plastic film. We had to ensure that the equipment would not be damaged by moisture or salt, especially since we did not know how long the crates would stay on Tromelin. Around 9:30 we closed them and finished cleaning the premises. We also made sure that no paper or piece of tape had been forgotten on the ground. Ten minutes before their arrival, the aircraft crew made contact on VHF, just enough time to position ourselves to film their arrival from all angles. The traditional group photo completed our stay. Exchanges and thanks to our friends staying on the island continued for a little while, perhaps to delay the scheduled departure. The latest accolades reflected the genuine bonds that developed despite the short duration of our mission. We finally boarded the plane with a heavy heart. At our request the pilot made a tour of the island that allowed us to take some pictures. The view is amazing and helped give us an unforgettable memory of Tromelin, knowing that we would probably never return. The return flight was extremely quiet. We relaxed and everyone was carried away by fatigue. As in the first leg, we conducted a short technical stop at Tamatave before returning to Mayotte. Upon arrival, we contacted our families to reassure them and to get some news. We found emails, comments and impressions that tended to reassure us about the quality of our work and proceeded to send the missing part of the log. We had not been able to send that last part from Tromelin due to a problem with the satellite connection. Many of you expected this last update. That last evening together was festive, but within the limits of general fatigue! The team split after breakfast. Again, hugs and handshakes were long. Franck, F4AJQ, and Fred, F5ROP, were the first to fly to Paris. Gil, F4FET, stayed in Mayotte for a few days for sightseeing and...more radio! Michel, FM5CD, Flo, F5CWU, Vincent, F4BKV, and myself (Seb, F5UFX) went to Réunion Island to debrief at the TAAF headquarters. We were greeted by Axel, FR5GS, and Stéphane, F5UOW, in St Denis. Both participated in the operations from schools on Réunion Island. The next morning, we met with the TAAF staff who welcomed us warmly. The responses following our mission were good. Preparation and seamless logistics allowed them to have no concern. Similarly, all communication activities were highlighted and appreciated in all services. The outstanding issues were addressed, including the repatriation of the crates. To conclude, we gave our thoughts extensively with the environmental conservation services and shared our findings on the nesting area for birds and species observed during the stay. We ended that day not without scheduling an appointment for a meeting and new exchanges in Paris during the 1st quarter of 2015. As this was being written some topics remained to be addressed. It is therefore not a conclusion but a reflection on the whole project. The simple fact that we were able to complete the mission is a satisfaction in itself. So many things could have gone wrong. It's a huge relief to be here today writing this text and to have no negative point to report. In this type of activity, the challenges are many and risk taking is important. This is of course part of the game and whatever happens we need to stand up for it. Throughout our journey, several steps proved to be major points of no return, which in addition to affecting the operation's success directly, would have been a major financial burden in case of failure: purchase of equipment, shipping of the crates and charter aircraft. Only a careful preparation leaving no element of chance allowed us to succeed.. The past year has not been a cakewalk. Each dossier was treated as a professional matter and was subject to strict monitoring. The same rigor was applied to all involved: the team members, small group leaders, external parties. The operators all had numerous expeditions under their belt before this one, including some from extremely popular entities. Naturally, we relied on these experiences to prepare this project. Thanks to all, "Tromelin 2014" is the success that everyone recognizes today. The objectives, whether or not directly related to the radio were achieved, even exceeded. With a track record like that, we would have immediately signed up for it a few months ago! After 10 days of operation, more than 70,000 contacts were made, while respecting the commitments and particularly that of giving a chance to ham radio operators located in geographic areas where contact with Tromelin is difficult. We made sure that we gave a chance to as many people as possible to contact us, although it must be admitted that all callers could not reach their goals. Nevertheless, we are pleased to have pushed back Tromelin ten places down in the ranking of the most wanted countries. Thank-you messages and positive reviews here and there on the internet abound and further support our satisfaction. With our findings during those eleven days and reading many constructive comments on our return, we could debrief with supporting statistics. Therefore we can raise some specific issue for consideration. Every effort has been made to allow as many different people to establish at least one contact. Since no band could have been used day and night continuously, we have tried to follow the openings and ensured virtually permanent presence on 10m and 15m, bands on which the propagation conditions were quite exceptional at the time of the DXpedition, even going beyond our most optimistic forecasts. From sunrise until the middle of the night, the radio traffic was directed towards the most suitable areas to contact at that specific time. From Japan to the Pacific through the Americas, the entire globe was thus scanned. Some of you have reported to us QSO made from their car in Japan, or with simple dipoles and 100w from California. Proof were it needed that anyone with an antenna, a little patience and experience has had their chance. The previous expedition (2000) that took place in the months of July-August, had made few contacts on the low bands. Being ourselves passionate, a focus on 80-160m was our second stated objective. Just hours after we landed on Tromelin, we were active on 160m. Many of you had a hard time believing that a QSO took place as it is so unusual. It is clear that this choice has paid off because the conditions were exceptional the first few days. Subsequently, we tried to improve reception by testing different devices (DHDL, beverages) even though the static level intensified. The best results were obtained with a reversible beverage as well as with the transmitting antenna as in previous operations. The final log displays more than 1,200 contacts on 160m and 2,700 on 80m. Again we have given our best to satisfy all geographic areas. Across all bands, the distribution of contacts by continent is what we wanted to achieve. We had to manage traffic and take advantage of each opening to allow Asia and the Americas to earn almost 40% of the contacts while the path to Europe was invariably open day and night. So yes, it was difficult for many of you to make contact as the demand was high. However, at no time had we suggested that it would be otherwise. Rest assured, it was necessary for us to give the best we had too. There was no respite or slackness on our part. None of the 70,000 QSO was easy, every call pulled out from the pile-up was hard work and deserved. After 13 years of silence, an expedition of 10 days with 7 operators was clearly advertised as a sprint which all radio amateurs in the world would participate. This has inevitably resulted in overcrowded bands, sometimes overflowing with all the difficult side effects to control: very broad splits, discipline problems. Despite these conditions, the operators have kept their composure and keep the rhythm while achieving a minimum error rate. Everyone followed the instructions and the guidelines decided earlier. We read here and there that our spilts were a little wide. Looking back, we think that sometimes they could have been slightly tightened, but not at the expense of speed or luck left to smaller signals. FT4TA is unlike some “QSO factory” expedition we encounter more and more frequently. Please be aware that there is nothing critical in this statement. This is just not to compare what cannot be compared! We appreciate all projects with a team of 25 operators operating from a rare entity for a month with 10 stations 24 hours a day. The contacts are easy, and everyone, regardless of their antennas, power and expertise, is sure to fill in a few lines in his logbook. Projects like FT4TA can never be this way for many reasons discussed above. This is a very good opportunity to challenge yourself and improve your equipment and especially your operator skills. 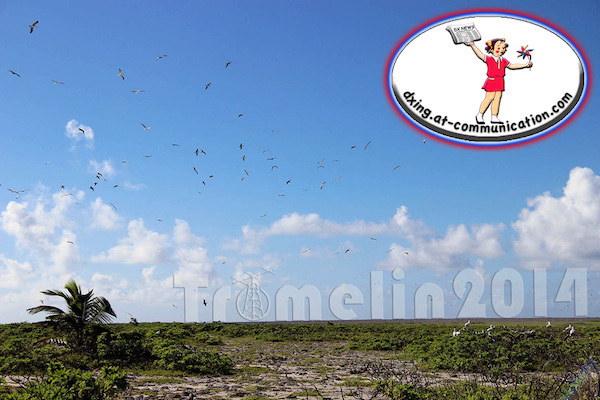 Tromelin2014 was meant to be an important promotional event for both the amateur radio world and for the TAAF. Our website was greatly successful and some pages dedicated to the radio operation or to more general articles on the island have generated an amazing number of visits. Each statement was widely relayed on a host of French and foreign websites. Our partners, DXworld and Clublog, also recorded peaks of activity. On a daily basis during our stay we transmitted via a satellite connection exclusive articles and photos for the "blog of the Head of Mission" on the TAAF website, a way to share with most our adventure and experience on this island so amazing. Our F6KOP buddies have reported the excitement around the TAAF stand at the philatelic exhibition. During these three days, the magic worked, particularly during demonstrations on the occasion of daily connections with Tromelin. From now on, all visitors will look differently at our antennas, wondering what distant island may be on the other end of the waves. TAAF was delighted with this provision that created an additional craze for the “FT4TA" stamp. Collectors from around the world are desperately looking for this stamp and even want to get the QSL card. In this regard, we have decided to mail all the envelopes received for QSL requests with this commemorative stamp. Envelopes will be mailed from Tromelin and decorated with exceptional stamps. Although this procedure extends some processing time, we wanted to offer everyone a last memory of our operation. In human terms, this experience will of course remain engraved in the memories. The team members are now linked by an indescribable feeling. We are aware that they are privileged in having obtained permission to access this protected area. The nights haunted by problems to solve now have left room for dreams populated with turtles, boobies and white terns. During our stay, we became aware of the work of these few guards who take turns to monitor, maintain and preserve this wildlife sanctuary. Tromelin is not like on the postcard. The ocean is hostile with violent currents, intense heat and an incessant wind. Under these conditions, how can we not give a thought to the slaves abandoned on the island for 15 years? The FT4TA project is not completed and it will probably never be. The team will be present as much as possible in the coming months to meet you at the various shows and conventions. Several meetings are already in the pipe: Dayton (USA), Visalia (USA), Friedrichshafen (Germany), Metz (France), Madrid (Spain). Others will probably be added. The video is also being put together and will be presented soon. Of course we already have several ideas for a sequel, but this will be, perhaps, a new history! Special thanks to the TAAF, DSAC-OI, Inter-Iles, G. Limouzi, F5UKW, W0MM, F8IJV, FR5GS, F6KOP’s & ARRA’s members, A. Baras, 4X4DK, F4ENK, F4ERS, N4AA, K6TU, our pilots stations & QSL manager F1NGP and our families for their support. and encouragements along this adventure. Thanks toElecraft, OM-Power, Spiderbeam, MicroHAM, DX Engineering, Messi &Paoloni, Palm radio for the equipment.